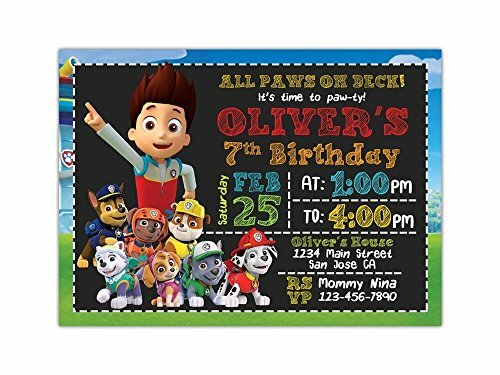 Paw Patrol Birthday Party Invitations ANY AGE Custom by MrUltimateInvites at Nicky's Blog. Hurry! Limited time offer. Offer valid only while supplies last. DESCRIPTION > Custom Printed Invitations in 5x7'' or 4x6'' > Front and Backside Included > FREE White Envelopes Included > Print on a Premium 100-lb. > Custom Printed Invitations in 5x7" or 4x6"
> Print on a Premium 100-lb. (265 gsm) card stock. > Click on the Select Options. > Select Sizes, Select Paper Type and Enter your party details. > Once your Order is CLEAR we'll start personalized your invitation. > Your order will set to print and be ready within 3 business days (excluded Saturday and Sunday). > Once the printed invitations are READY, it will be ship through USPS and usually delivers within 5-8 business days (excluded Saturday and Sunday). > We'll provide tracking number once available so you can track your package. NOTE: We don't send proof to avoid delays. Please DOUBLE CHECK your spelling & punctuation. Be sure to submit the wording EXACTLY as you would like it to view on the invitation. If you have any questions about this product by MrUltimateInvites, contact us by completing and submitting the form below. If you are looking for a specif part number, please include it with your message. FortNite Video Game Personalized Birthday Invitations More Designs Inside! Fill In Invitations, Set of 20 Rustic Wood & Flowers, Wedding Invitations, Rehearsal Dinner, Bridal Shower, Baby Shower, Bachelorette Party, Engagement, String of Lights, 4.25" x 5.5"
Minnie Mouse Baby Shower Personalized Invitations More Designs Inside!